No wormhole has ever been detected. Science fiction writers like to invoke wormholes as useful ways to violate the known laws of physics (for instance, making objects disappear into nothingness or appear out of nowhere, for no apparent reason), but real wormholes, if they exist, would destroy anything on a terrestrial scale that is near one of the openings. 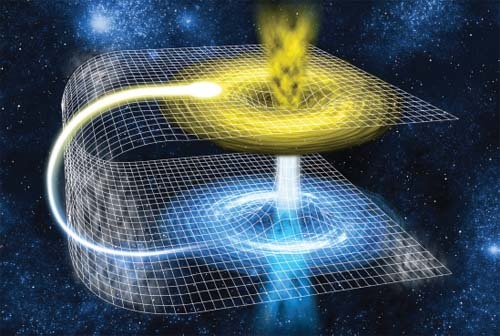 The idea behind wormholes is that a gravitational funnel bends space, linking one part of the universe with the other in a one-way tunnel.